Below are the Classic Coatings Standard Terms and Conditions of Sale prepared by Brad Roberts, President of Classic Coatings, on December 30, 2009. 1) Cert Charge: First runs requesting a cert will be at no charge. Each additional cert thereafter will be charged $15 each. 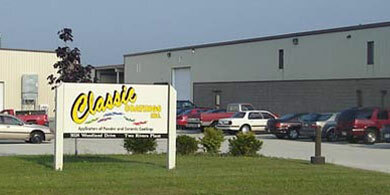 2) Classic Coatings, Inc. will process the customers' parts as per their written instructions. If no instructions are provided, Classic Coatings will use industry standard methods to coat the parts. 3) Any masking on the parts must be called out in the quote. Classic Coatings assumes no responsibilities for masking that was not called out in the request for quote. Failure to inform Classic Coatings of masking requirements resulting in rework is the liability of the customer for all materials, outside services, labor and recoating of the parts in order to conform to the masking requirements. 4) All quotations are valid for 90 days from date of the quote. After 90 days, prices may change without notice. 5) Freight is not included in our pricing unless it is specifically stated in the quotation. 6) Classic Coatings liability for damages due to defects in workmanship or material is limited to no more than the bill for the materials or services that we have provided. By placing your order with Classic Coatings you agree to this limitation of liability. 7) Classic Coatings is allowed a shrinkage factor of 2% for processing without liability or charge for loss. Classic Coatings assumes no responsibility for counts or inspections needed on parts delivered from a third party. by others. Classic Coatings is not responsible for work done by others unless we have agreed to it before hand in writing. 9) In the event that coatings applied by Classic Coatings do not turn out with the desired results due to various metal conditions such as out gassing, bleed out or various other metal imperfections, Classic Coatings will not be responsible. 10) Classic Coatings reserves the rights to reject any material that it deems inappropriate to coat and obtain desirable results. The customer is responsible for all charges to prepare the metal to make it acceptable for coating. 11) Classic Coatings assumes no responsibility for coatings applied by others. 12) Classic Coatings is not the insurer of the customers’ material while it is on our premise and shall not be held liable for loss or damage due to theft, war, vandalism, fire, flood, wind damage or any act of God while these materials are in our possession. 13) Any special fixtures, racks or tools having been designed, built or modified by Classic Coatings shall remain the property of Classic Coatings whether paid for by the customer or not. 14) In the event that an order is canceled by the customer, all associated charges up to the time of the cancellation are the responsibility of the customer to reimburse Classic Coatings. 15) Any materials belonging to the customer and are in the control of Classic Coatings are subject to a general lien for all money owed to Classic Coatings for previous work done or any charges outstanding. 16) A service charge of 1.5% of outstanding invoices per month is due if not paid within the terms and conditions stated on our invoices. 17) The customer shall pay all costs, expenses and attorney’s fees incurred by Classic Coatings enforcing the articles of this Terms and Conditions of Sale. 18) Classic Coatings makes no warranties expressed or implied as to the workmanship, quality, durability or function ability of any parts coated unless provided in writing. 19) Classic Coatings acceptance of your order is made conditional on your agreement to these Terms and Conditions. 20) Classic Coatings Terms and Conditions supersede the customers Terms and Conditions in all cases.